As I mentioned earlier in the week, my friends and I went on an exciting backpacking trip in Michigan over Labor Day Weekend. The views along the river were gorgeous and the company was funny and inspiring. All in all, it was the perfect girl’s weekend! We split up the food responsibilities, and I was in charge of breakfast. I brought along one loaf each of Dark Chocolate Covered Raisin Banana Bread and Zucchini Almond Butter Bread for the road. 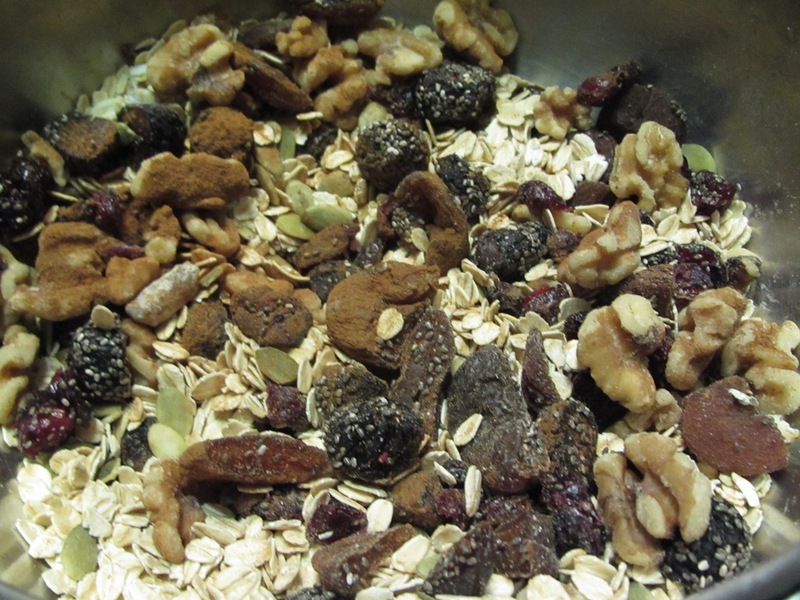 I also made one of the best trail mixes ever. I’ve titled it…Everything Left in Jen’s Pantry Trail Mix. What is in this crazy looking mix? Sounds odd…but I promise you it was amazing and our favorite snack along the way! In my search for the perfect portable breakfast, I rediscovered this recipe. I had actually made it last Memorial Day for dessert. Although I loved the flavors, especially all the dried fruits and seeds, it wasn’t sweet enough for dessert (for me anyways). It does, on the other hand, make the perfect hearty and flavorful breakfast! I followed the recipe as written using Almond milk because that is what is in your fridge. For dried fruits, I had a fantastic combination of figs, apricots, cranberries, and cherries. The nut and seeds were plentiful including pumpkin, chia, and flax. To sweeten it up a bit, I covered the top with a sprinkle of cinnamon and turbinado sugar. This breakfast did not disappoint! Easy to eat by hand and full of healthy ingredients guaranteed to power us through our day, we ate it Day 2 of our camping trip right along the river. Of note, we did not eat ALL of this food for breakfast Day 2, but we did have to tie it up in a tree overnight to keep away the critters, so it all came out to be redistributed in the morning. Also of note for those on the go…the oatmeal bars tasted wonderful Day 2, but did not stay as fresh without refrigeration by Day 3 (like many of the other foods), so if camping, plan accordingly! These bars are quickly becoming my all time favorite energy bar EVER. You should check out the full recipe HERE and just an FYI, they stayed fresh without being refrigerated the entire trip and were sweet and tasty for (Day 3) Monday morning’s breakfast by the dam. Exactly like THIS recipe except, I subbed in a carrot cake mix instead of a spice cake mix. If possible, I think that the carrot cake had more ‘spices’ than the spice mix. And…because I had some leftover sweet potato in the house that I knew the BOY would not eat, I mashed it up and threw it into the batter. These muffins were a huge favorite amongst my crew. We even shared traded them in for a beer on the last day of our trip. If traveling, use a tuberware container or be prepared for the muffins to form one big block of muffin in a plastic bag, which is just as tasty, but looks a little funky! And last, but certainly not least. I loved seeing Emily and her family hiking in Washington this summer, and I have been drooling over her Coconut Energy Date Bites. I knew that they needed to be part of my weekend. My energy mix was a tad try so I drizzled in a smidge of agave, seriously maybe a tablespoon at most, into the food processor, which was exactly what it needed. The balls formed easily and I rolled them in more coconut. Then packed them away in a container for our hiking trip, eager to eat them on the trail. Which is exactly where we enjoyed them during a hiking break! They were just as amazing as I thought they would be and traveled VERY well! All of our food was incredible, and these breakfasts can be made and devoured whether you are on the road, on the trail, or just sitting at home enjoying the morning! What is your favorite Hiker’s Grub??? It was a busy week back at work and I am back in class this weekend (Friday through Monday), so I have been a little slow getting my backpacking pictures and recipes up to share. But I promise…they are coming soon! Honestly, it doesn’t get much more simple than this. Make sure your dates are pitted, and then chop them into bite sized pieces. 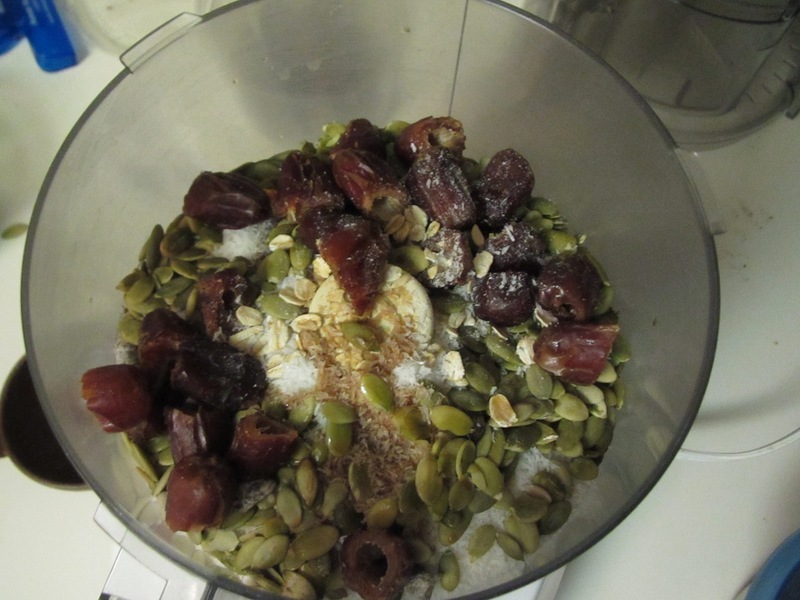 Add dates, oats, coconut, vanilla, salt, and pepitas to a food processor. Zest one orange over top of the food processor, and then let it spin. 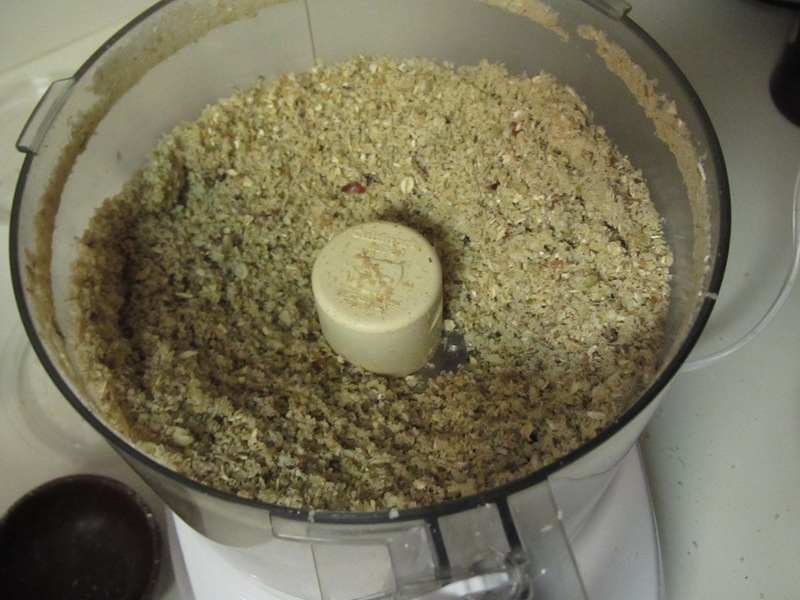 The mixture will be dry and crumbly – let it process for a minute just to break down some of the bigger ingredients. Slowly add about 1/4 cup of water – add just until the mixture becomes wet and a bit sticky. Scoop out tablespoon sized portions and roll into balls. They will have a bit of stickiness to them, so I like to roll them in dried coconut to help prevent them from sticking together. Pour wet into dry. Stir to combine. Pour into a 9×9 baking dish either coated in cooking spray or lined with parchment. 170 calories, 3 grams fiber and 5 grams protein. Notes From KERF: While delicious, the only sweetness in these comes from the dried fruit. Add in 1/4 – 1/2 cup brown sugar if you like. 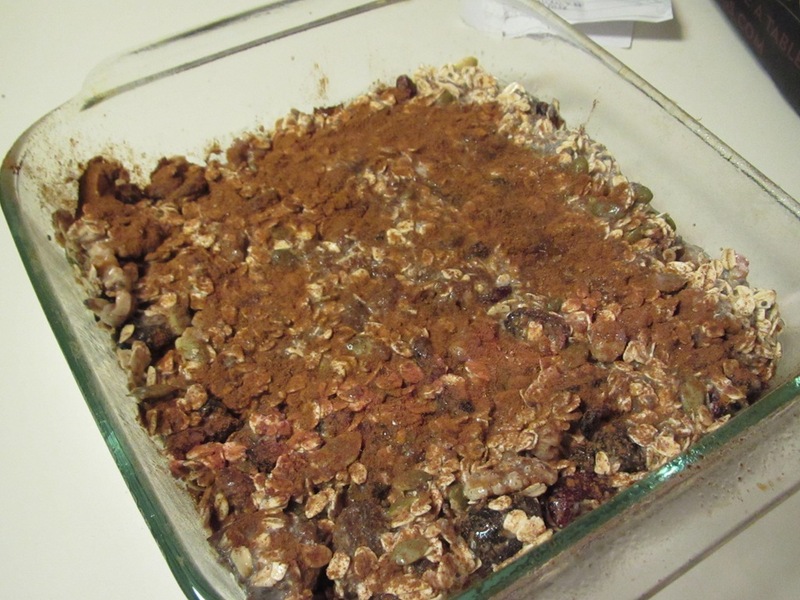 The variations are endless: cranberries, coconut, all kinds of dried fruit, nuts, etc. Sounds like you guys had a great time. You certainly ate well, with those oatmeal cookies sounding just about perfect. We ate VERY well…I haven’t even shown your our dinners yet : ) The food is defintely one of the best parts about backpacking! Oh, I’m going to have to remember these oatmeal bars! JP and some friends are doing a triathlon this coming weekend, and I think I’m going to try my hand at baking some pre-race breakfast treats. These look like they’d be perfect! They will be and you will love them! Plus, they are super easy and you can get as creative as you want with the seeds and fruit. Let me know how it goes. Are they doing the Lake Geneva tri? Good luck JP!!! He is doing LG! Will you be there??? I have a friend doing the Fat Tire back ride, so I am considering heading up for the day. I’ll keep you posted! Seriously impressive camping food! Those all look great, and with a little pre-camp work you have a lot of awesome meals and snacks! I love an excuse to play in the kitchen, but all of these recipes turned out really good. I”m excited to make the energy balls again soon!